What a great story! Visual art becomes performance art. Of course there was no terrorism alert when the banks were blowing up the dreams of homeowners and burning all of us. Television gold Alex. I think we need to call Bravo or Lifetime to do a reality show. I love this "on flames" series. thank you both! There will be more! This story needs to go to InfoWars.com (Alex Jones). They are constantly reporting on how often citizens are being "taught" to snitch on fellow citizens ("If you see something, say something") al la "1984" (and dare I say Nazi Germany?). For crying out loud, you're painting a picture and you get investigated while the building your painting is filled with crooks and accomplices. 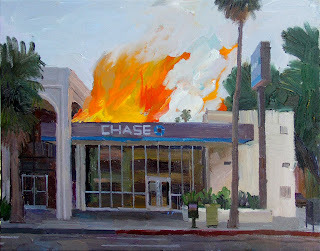 I would love to send you a photo of the Chase branch located in my village in order to have you paint it in the "Burning Chase" theme. I will gladly pay for the work to be done. Please contact me at tikipalm at gmail dot com. love the work. You did a beautiful job with the flames. That is not easy to paint. How much does a burning bank sell for I wonder? Sad they wrote you up. what was the charge? how much was the fine? I have some work that features the capitol bldg on fire, also some carbombs. I guess painting fire is akin to shouting fire. i.e. not protected speech!! Great way to make a statement!!! What were you written up for? 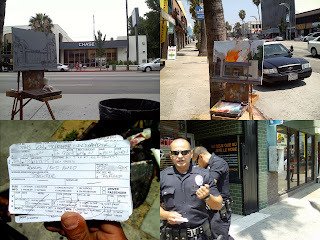 Were you given a citation or did they just demand and record your personal information. I would be extremely interested in purchasing a print (or even an original). Some people have all the luck. I've been painting news/politics/religion/nwo for years. Love to see someone hit the big time. Sorry it had to be this way though. Love this! I love the story too. To imply that your artwork could be related to terrorism makes me think of how Politicians like to distort the truth to suit their agenda. Sounds like the bank called the cops on you as a form of information control. I think artists should do more provocative pieces like this and really "push the envelope" of information distortion. If there is a lawyer out there that can answer...couldn't you have just said "piss off"? You weren't breaking any law. They can just come up to anyone on the street now and say "let me see your papers"? I love the placing it for sale based on gold price! If I could paint.....! idiotic comments aside,this story proves that bankers are living in fear of us all,artists included.they are afraid to the point of paranoia,and i wouldnt change anything.let them live in their paranoia,and die by their fear.its our best weapon against those who count us like units in their percentage. It might seem surprising ,but if you ve lived in a country where CIA was running things ,and police was their handy man for tortures of people with opinion,any opinion .USA and international rich perverts want to have total control .and because they know they are guilty they are afraid.i m so glad it is so.its the revenge of the people.its the life noone wants.i wish you all die from horrible deaths you perverted profit seeking bastards.sorry mates i had to say it .on a merrier note,these policemen must have been real dicks,uneducated (as is the norm),full of complexes (again norm) ,without any sense of logic that requires you to use what you have in your head(norm of course).oh man what a cooperation between them rich and their slaves....enough ,already.do you really want us to get anrgy?you really believe police and weapons can save you ?then you really deserve to die in your fear and agony. Please resend to every bankers you might know.let us enjoy our moment,let us feel their fear ,and feel good about it...these are the only humans i d like to see leaving this planet and start their own society on another planet away from our solar system.put them all in a spaceship and off they go.bon voyage bastardinos. PS:to the artist ,keep painting at your discretion,beware of courthouses and stay away from police stations.also keep in touch with people so we dont loose you suddenly. (i know you are propably scared in a way ,but remember ,we will make you a hero of the revolution(just kidding...)but fear can be real.so keep in mind,you are not alone,we are watching ,the whole world is. Well done Shaefer - great idea, great painting, iconic!!! Next a series of spontaneously combusting Bwankers, please? Nothing has changed throughout history - money means power. There was a blip in UK after WW11 with the advent of NHS, social housing , abundant jobs etc., but now we're back to rich and poor. The rich are rich because the poor are poor. Thanks again Alex. Well done Shaefer! Great idea, great paintings, iconic! Next a series of spontaneously combusting Bwankers, please? Nothing changes throughout history - money equals power. There was a blip here in UK after WW11 with the advent of NHS, social housing, abundant jobs etc., but now its back to rich and poor again. The rich are rich because the poor are poor. Thanks again Alex. Way to go on selling the painting!!!! I just checked ebay. You still have 8 hours left and I think you are going to be thrilled!! as soon as I find out the legalities of doing a series of prints I will let people know on my blog! I'm presently slammed with a million things but I want to get on this soon! Thanks for the good words everyone! You have found your calling. Guaranteed you will be able to make a great living at painting canvases of Banks burning. Kudos, the painting rocks! Hilarious that the Police came. Usually takes them hours to respond to a call. Unless it's a possible spooky "Terrorist" Oh No! Alex - You are an American Hero ! Have you considered t-shirts and bumper stickers so we can all help get the thought across? ... And you can earn some well deserved additional income .... bet you could sell 100,000 t-shirts! I knew the painting was yours the second I saw the photo at the top of the article. NPR quoted this from L.A. Taco. "The irony is that now the only people who can afford to buy his work are the same people who looted the financial system in the first place – bankers." Seastone, the NPR article is quoted as "In an auction on Ebay . . ." You know how an auction works, right? Because the bidding started at $920, if you follow the link in the NPR article. That's a far cry from what the art sold at. In fact, it says less about him and his personal finances than it does about those so eager to buy his work that they bid from $920 to $25,000 . . . When you learn about the art world you start to realize it's a racket like the stock market. I thought that putting the work on ebay was a good way to sell the painting, fair, democratic, real world "price discovery". the comment that only bankers can afford my work is a little misinformed, I have all kinds of work at all different prices. And while the buyer wants to remain anonymous, I will only tell you that they are NOT a banker in any way, dispel the thought! ahahahah! When Ed Ruscha painted his famous "burning buildings" works in the 1960s, nobody phoned 911! You are carrying forth a great tradition--keep it up!